By the look of things, 2019 is shaping up to be a great year for Kia. This year’s models are the most mature I’ve driven, and there’s no question that Kia is now a fierce competitor in its market segments. The MY19 Cerato confirms this. Refined, reliable, high tech and a real looker, this is easily the best Cerato yet. Powered by a two-litre petrol engine and mated with a six-speed auto, there’s power, fuel efficiency and smoothness all wrapped up with a bow. Two models will be available in the Cerato range – the LX and the EX. The LX is anything but ‘entry level’, with assets that rival some high spec competitors. The EX is the more luxurious model, with leather composite seats, extra safety features and some sportier styling options. Tauranga Motor Company is one of the lucky dealers to have a new Cerato available to take for a spin, so that’s exactly what I did. Our test model is the Cerato EX, and I’m sure that stands for ‘extra special’. From the outset, the new Cerato is visually very different from its predecessor. A sportier, aggressive styling makes it a stand out - rather than a blend in - type of car. The LX comes with 16-inch alloy wheels, while the EX gets even bigger boots via 17-inch alloys. 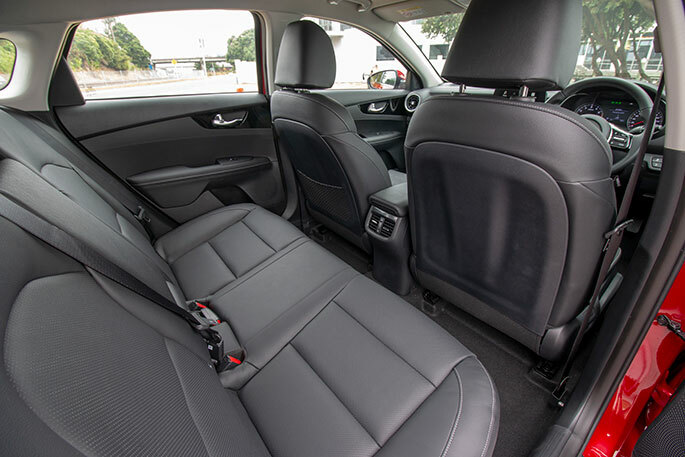 Similarly, the inside of the Cerato is grown up. For a car of the mid-sized segment, it is almost executive in its look and feel. Space is certainly no issue either. The cabin feels incredibly spacious, and the boot is almost as big as space itself, less a few stars and the deadly radiation of course. 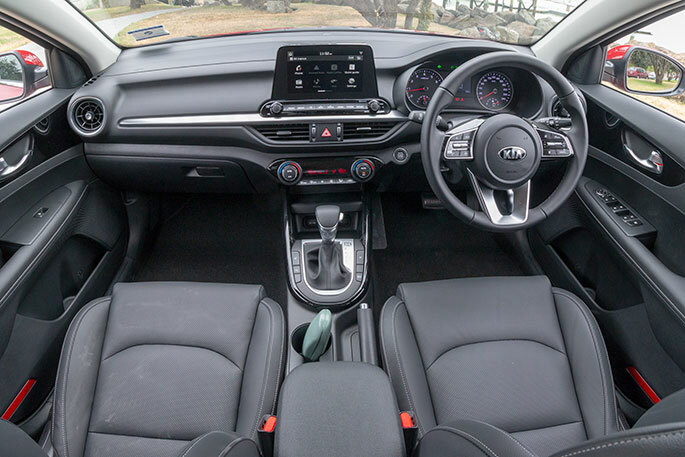 Not only is it spacious, the Cerato is incredibly comfortable and could pass for a GT without a problem. Space front and back, highly adjustable driving positions and, in the EX, a beautifully supple leather-wrapped steering wheel all add to the feel of the car. In both the LX and EX, you get all the toys built in to the infotainment system. Apple CarPlay, Android Auto and reversing cameras are all served up on a crisp, clear 8-inch display. There’s Bluetooth phone pairing and a sat-nav too. Most of those can be controlled by voice or via steering wheel, so there’s no excuse to take your eyes off the road – not that there’s ever a good reason to do that! The front seat driver and passenger also benefit from three-way heated seats, for those nippy days that insist on coming around once a year. There’s USB and AUX ports, so you can bang out your favourite tunes through the Cerato’s sound system if that’s your bag. The new Cerato is yet another car in Kia’s line-up with the coveted five-star ANCAP safety rating. The Cerato boasts electronic stability control, blind spot detection, lane keep assist, forward collision warning and rear cross traffic alerts. And let’s not forget Autonomous Emergency Braking. Hopefully this is not something you will ever need to use, but it is a huge benefit in terms of avoiding accidents. Out on the road, you’ll be more than happy with your purchase. The two-litre engine is a match for the car, with a spirited take off when required and a relaxed cruiser for coasting along the highways. It’s also pretty economical for the size of the engine and car, coming in at 7.4l/100km combined fuel consumption. Agility around town is no issue. Even though the Cerato is well proportioned, the assistive cameras and collision detection alarms make parking a doddle. Steering is also highly responsive, so there’s no issue moving around those twisty inner streets. Price wise, once again Kia gives you a lot of car for your money. The LX has an SRRP of $27,990 + ORC (RRP $31,990 + ORC) and the EX is a snip at an SRRP of only $29,990 + ORC (RRP $35,990 + ORC). Both models come with three years’ free servicing, a five-year/100,000km warranty and five years’ roadside assist. Although the Cerato is coming soon, Tauranga Motor Company on Cameron Road already have a lovely red EX for you to test drive so you can get your order in nice and early ready for delivery. If you can spare the extra pennies, the EX model is certainly the one to go for with its additional refinements, but that doesn’t mean you won’t be perfectly happy with the LX. Of course, Tauranga Motor Company can also deal with your finance requirements, and even take your old car as a trade in. Once you do trade in, you won’t look back.